In 1914, our founder William A. McCree, a carpenter by trade, realized the value of the pencil (design) was just as important to customer satisfaction as the hammer (building). 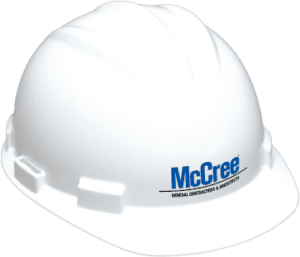 When he founded McCree in 1926, Bill instinctively carried this design-build union into his construction company in both theory and practice. Bill became a student of design and sought close working relationships with architects, including the likes of James Gamble Rogers II and other prominent Central Florida architects. Bill trusted their talent for design and they trusted Bill to build what they designed. As with contractors, not all architects are equally accomplished at their craft. In the 1940s, Bill noticed that many owners too often found themselves in an adversarial relationship when hiring separate architecture firms and general contractors to complete their project. The owner, seeking the best price, trusts the architect to keep plans within budget. After investing thousands of dollars and significant time in producing the blueprints, the plans were often incomplete or didn’t adequately address the complexity in the real estate itself. This resulted in change orders, designs on the fly, ensuing schedule delays and rocky relationships. In Bill’s mind, these budget-busting activities were easily avoidable. There had to be a better way to serve the customer. By following his sense of doing what’s right for the owner and the real estate, Bill McCree became a forerunner for the Design-Build method long before it was formally an industry term. He didn’t set out to create a construction method. Rather, Bill followed his instincts for cultivating trust through caring and stewardship, which was a professional expression of his inward commitment to glorifying God and serving His people. Enhanced Design-Build is creating a true one-team approach and eliminates construction adversarial probability. We get things right the first time or we make them right. The burden this risk shifts to McCree because we gladly accept responsibility for the entire construction project. And we like it that way. It enables us to have complete oversight of your project to control costs and schedules more effectively, deal with problems more efficiently, and ease your life throughout the design-build process. You contract with one firm from feasibility to planning to completion, even for maintenance. Our firm has experience designing and building a great variety of projects. Since we live and work in Central Florida, we know the area and the regulations and have a genuine interest in seeing the area grow beautifully.